After 21 years of working in the Prince George’s County (Md.) Fire/EMS Department and retiring as a Lieutenant, Eric Schrader, 42, moved his family to Florida to reside in Ft. Meyers. Following a year of living the retired life and relaxing, Schrader found himself wanting more. 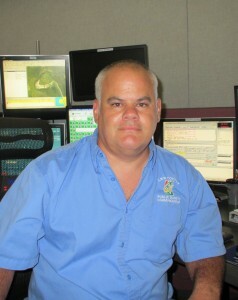 When he discovered an opening for a Fire/EMS dispatcher in Lee County (Fla.), he pursued it and got the job. Though he was accustomed to riding fire trucks and responding on the street to fires and critical incidents, Schrader was now on the other side of the fence in which he had to look after hundreds of ambulances and fire trucks. It took a while for him to become comfortable in the job. “It was a good couple years before I was fully trained. I love the job now. I still look forward to going to work,” Schrader says. Schrader’s prior career experience as a veteran firefighter is helpful in his current role as a senior communications operator for Lee County Public Safety Communications because he understands what those in the field are going through. He assists unit officers, paramedics and other emergency personnel with directions, locating hospitals and other duties as he serves on the other side. “I have an intuition about what they’re going through, and I can anticipate what they need,” Schrader said. Schrader is well aware of how stressful these various incidents can be when working the radio. He acknowledges that one may need to step out for a breath of fresh air after working a stressful call. In his jurisdiction, one of the most stressful calls for dispatchers is when a child is drowning. The dispatchers can relate because many of them have children and most everyone in the area has a pool. The dispatcher has to calm the caller to the point where they can receive instructions via phone on how to do CPR. “We’re relieved when the first unit arrives, and we can hang up. That’s when it all hits you. Especially me, with three kids—I can’t imagine what that mother and father are going through,” Schrader said. He acknowledged that some days there are multiple incidents of this nature. The dispatch center in which Schrader works has 32 employees that are spread out over four shifts. He ensures everyone works well together. “Each shift has to be a well-oiled machine, Schrader said. “When we work nights, we have to be awake for 12 hour shifts and get along together.” At times, that can be difficult. However, whenever there is any down time, training drills are utilized to prepare dispatchers for the “what if” situations. Schrader reveals some important skills necessary to be an effective dispatcher: the ability to multi-task and possessing “great communication skills,” particularly with 9-1-1 calls in which dispatchers must take control of the situation, calm down the caller and ascertain the location of the incident. Schrader, who builds his own computers as a hobby, is notably tech-friendly, and his skills are suitable on the job. “It is all computerized now, and there are seven monitors we have to look at,” he said. One of Schrader’s most memorable calls involved an unconscious woman on her honeymoon. In the background of the call, he could hear the best man screaming. Schrader gave instructions on how to administer CPR to the female. When paramedics arrived and took over, they were able to bring her back to life. It was subsequently learned the victim had an undiagnosed heart condition. Having made an impact in the fire/EMS service in Prince George’s County, and now utilizing his skills and knowledge to enhance public safety in Lee County, Schrader seems to have the best of both worlds. “I consider myself one of the luckiest persons in the world. I’m blessed to have had two careers I loved,” Schrader said. Meanwhile, he continues to make a difference.